Let’s face it – American society is really focused on the notion of beauty and youth. Cosmetics to keep you looking young. Vitamins to keep you feeling young. New cars. Capped teeth. Trendy diets, juicing and cleansing. It’s hard to get away from. Now you want to buy a home, or you want to sell your home. It’s older than a year. During a walk through, the initial negotiation stage, or even during a home inspection from an overzealous examiner, you should be wary of some highlighted issues that could be blown way out of proportion by a realtor. Cosmetic issues in a home have become a headache to people selling, as nervous buyers will terminate a deal within weeks of closing over simple problems. It’s also an issue to buyers who may develop second thoughts that are not necessary, when the fixes needed are overstated, or not needed! Cosmetic what, huh, what now??? 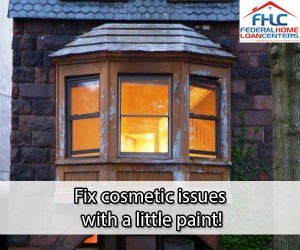 Cosmetic repairs for a home are ones that do not affect quality of life or endanger you. Some people are only focused on homeownership and do not care if there is mismatched paint, a smelly carpet with stains, or normal cracks due to foundation settling. No home you move into is going to be perfect. Even a brand new home is going to succumb to the elements of time and people coming and going from it. 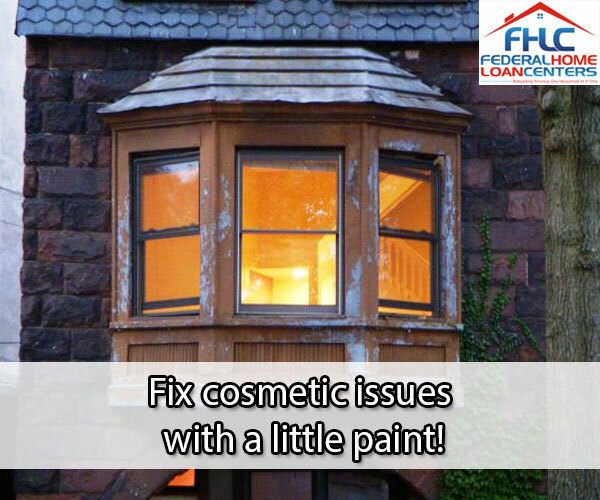 These cosmetic issues can be fixed or covered up with decorating, heavy cleaning or DIY home improvement. Nail holes in the wall = Get a spackle kit at a home improvement store, usually under $10, and request a small sample of paint that matches the wall. Spackle kits will usually come with backings, a sander and a spreader. These are quick and easy fixes. That, or kill two birds with one stone – hang up something else in that spot, as long as the nail hole is secure. Replacing blinds = Put up curtains or replace blinds one window at a time. Curtains may be the best aesthetic option and you can usually get them for cheap by looking up “curtain outlet stores” on a search engine. Just keep the blinds open behind the curtain so that it will be hard for the passersby, and visitors, to notice any imperfections with the blinds. That, or just remove the blinds, which is a quick process, and temporarily rely on the curtains for privacy. Dirty, ripped up and/or smelly carpet = Rent a heavy duty carpet cleaner, which should cost less than $100 if used in under a week’s time, then buy ornamental rugs for any spots of carpet that are ripped or stained beyond repair. This is a good temporary solution and less expensive than getting all new flooring. If stains or rips are closer to the walls, move some furniture, an umbrella bucket or a pet’s bed to cover it up, for now. Ugly wallpaper or mismatched paint =If you just want to get your walls to a bland, acceptable color like eggshell or beige, the cost per gallon can get pretty low, as long as you are willing to put in the time to do the job yourself and do it properly. There are tools to buy for less than $10 a pop to remove wallpapering yourself. If you’d rather have a professional paint a room or remove wallpaper, which are both expensive processes, maybe put up some wall decorations or large pieces of art if you can only afford to remove the paper or repaint room by room. Aim to change wallpaper or re-paint in communal rooms (living room, kitchen, foyer) that others will see first, if you’re really worried about people aesthetically judging you. Stains or scuffs on painted walls or doors = Melamine foam cleaners, aka the white “eraser” blocks you see advertised a lot with a certain bald-headed guy’s character trademark, are great at cleaning these kinds of stains and should not negatively affect the paint. They’re also good for soap scum, too. Dead plants and a yard with weeds and mostly dirt, especially in areas prone to droughts = First, pull weeds out entirely. Pull out, or chop down the dead plants and see if there is any way to repurpose all that organic material, such as a compost heap. Put in pavers, aka large stones or squares of recycled material, all over your front and back yard. Buy some drought tolerant potted plants to randomly place about the front and back yard, to give it some element of vegetation. This frees you from the maintenance of a traditional yard and it’s also a great method to save water. You can always keep one patch of dirt free if you have a dog that needs it for potty purposes. The biggest worries regarding owning or selling the house can be avoided by getting a home inspection, which has nothing to do with cosmetic issues. The process will check for the important things: leaks, shingle and roof issues, plumbing problems, patchy insulation, vent cracks, and foundation issues with the property. Aside from this measure, you definitely will want to conduct a termite inspection. You, or your Realtor®, can also get a C.L.U.E. report, which is a disclosure of losses within the last seven years for the property. These Problems Found? Proceed with Caution! Homes that need numerous electrical upgrades such as replacing wiring, circuits, outlets, etc. In the end, don’t let a Realtor® detour you from buying a property because of cosmetic issues that could be easy fixes. You can change the carpet, paint a room your favorite color, or use home improvement to your advantage creatively and monetarily. A bad surrounding environment, or health and safety hazards, can’t be fixed as easily. As long as you know you can afford any regular maintenance on the home, your next step is to be aware of where you will live. If you like the neighborhood and take into account how your commute will be affected, what kind of shopping and amenities are nearby, and that the surrounding school district will be good for your children (or future kids), these are the things that truly matter when looking for your new home. If there are cosmetic repairs that total over $5,000, or even anything health and safety hazard related, adapting a home, or making a dwelling energy efficient, you do have a great option at your disposal. You can read our blog about 203(k) loans here.